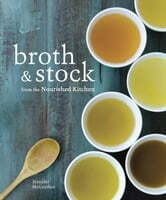 Broths and stocks have always had a central place in kitchens around the world owing to their ability to comfort, nourish, and heal. In Broth and Stock from the Nourished Kitchen, Jennifer McGruther, an authority in the traditional foods movement, shares accessible recipes that are appropriate for vegetarians, pescatarians, and meat eaters alike and showcase the nutrient-dense, real food that nourishes the body and soul. The Whole Chicken Broth is the perfect base for Springtime Risotto with Asparagus, Green Garlic, and Chive Blossoms, while the recipe for Fish Stock will bring new life to a classic dish like New England Clam Chowder. People are catching on to this centuries old appreciation of bone and vegetable based broths, and Jennifer McGruther shows how these can be made quickly and cost-effectively at home.